Who....my daughter Beth, who loves Sweet Balance as much as I do! I’m sure it must have been a gentle Flow Class....but then I tried them all till I found my favorites. I have three favorites. It’s hard to pick just one. 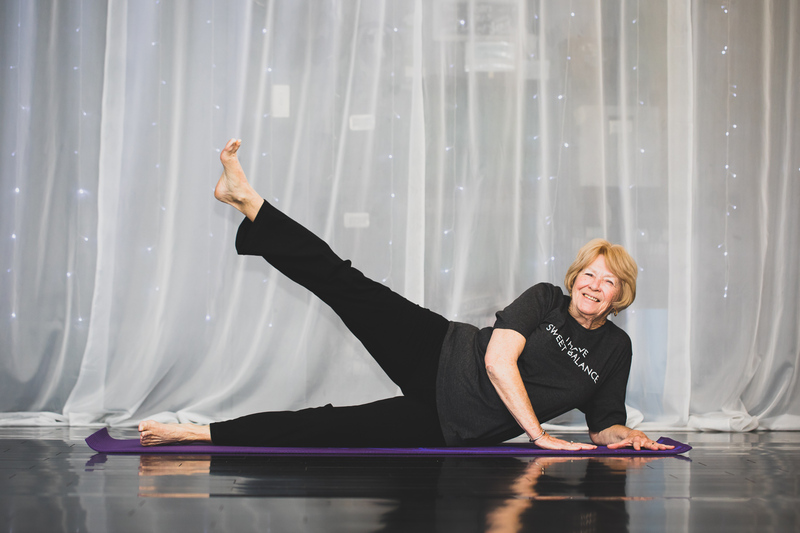 I love Rachel’s Gentle Flow and Restore, and her Saturday morning Gentle YinYoga Stretch. I also try to get in at least one of Lisa’s Balanced Body Classes when I can. I have had many teachers at Sweet Balance, who were all supportive, kind, gentle, and huggable! I love the people, the space and I always feel comfortable and welcomed. I also want to keep moving as, like many others, I’m getting older. 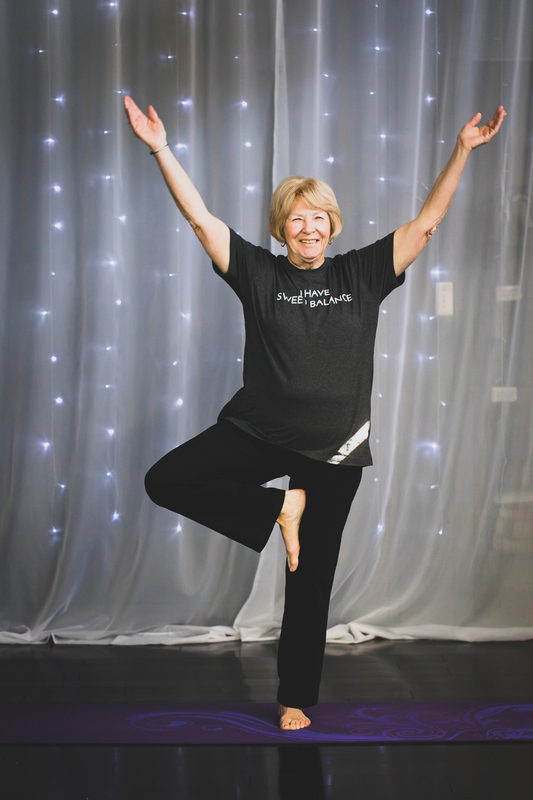 I’m 75 now and looking forward to more years with the help of Sweet Balance to keep me balanced, stretched out and able to move freely and do what I want to. Yes, I often think of that “yoga breath” at times of stress. I enjoy teaching yoga to 4 and 5-year-olds and will continue as long as I can get off the floor and can keep the flow going. I had to think hard about this question, but I think it’s my “easy seat” at the beginning and end of yoga class. When I close my eyes, take a deep breath in and out, I put myself in a quiet place. I totally relax....just for me. I would tell them that I did not start Yoga till I was in my 50’s. At 75, I’m more flexible now than I was then. Most of the time I have better balance, and I certainly have more movement in my limbs. Give it a try! You might like it! 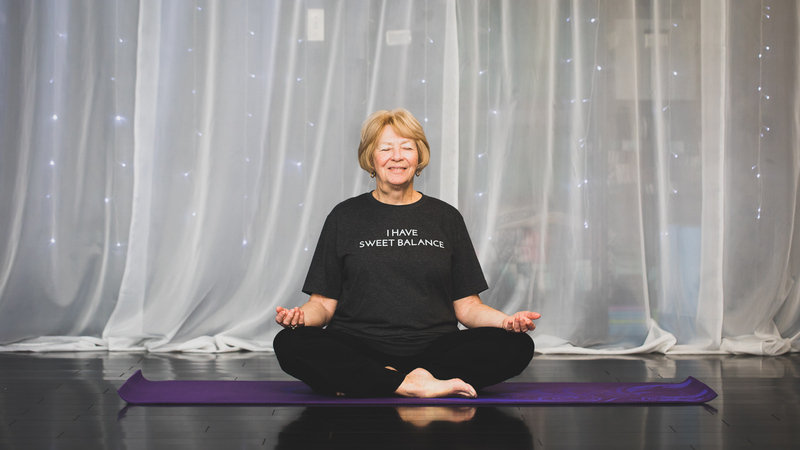 Sweet Balance is a soothing space with wonderful teachers and soon to be friends. You will be calmer and feel better about yourself on your way out than on your way in. I wanted to try out yoga as a way to get back into a regular exercise routine and try something I haven’t done before. From my first class at Sweet Balance, I knew that was exactly where I wanted to be!